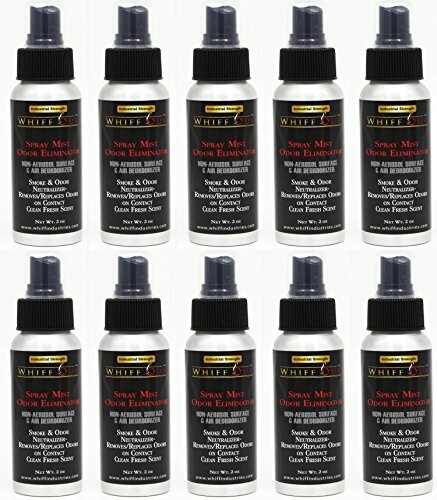 Whiff Out Spray Mist is an industrial strength smoke and odor neutralizer. This includes 10 of the same sprays. Includes 10 spray deodorizers with a clean, fresh scent. Non-aerosol surface and air deordorizer can eliminate odor in bathrooms, hotel rooms, offices, public areas, upholstery, clothes, floors, shoes, storage areas, cars, beds, carpets, trash bins, hampers, and more! Create a luxurious environment no matter the application. If you have any questions about this product by Whiff Out, contact us by completing and submitting the form below. If you are looking for a specif part number, please include it with your message.